By Karl R. Studenroth Jr. Welcome! This site is an online journal and highlights ecological and herpetofuanal observations, records, reports and photographs by Karl R. Studenroth Jr. In this site I report unusual or interesting animal behavior, or significant distribution records or range extensions. I also make avaialable the results and summaries of many of the research projects I have conducted over the years. I'm utilizing this site to report these observations and information to other biologists, researchers, museums, State or Federal agencies, and any interested parties. Most information on this site has not been published, or has only been submitted to specific agencies. Some information has been shared with other biologists and individuals over the years. This site provides information much quicker than submitting the data and reports to various journals and agencies. More materials and information will be added periodically. If you wish to utilize any of the information at this site, I ask that you properly credit me. If you have questions or comments about any of the data or observations on this site, feel free to contact me. Enjoy the info and critters! Studenroth, Karl R. (2007). Online Ecology Journal. Retrieved (insert the date you retreived the information from the internet). Source: www.nwflec.com/ecologyonlinejournal. Also, state the page, and the title of the page/information you took your data or citation from. Today, January 20th, 2017, nearly ten years later, I added a Guestbook to this site. Feel free to leave your comments about this site. Enjoy! Pg. 11 Interesting & Unusual Wildlife Observations & Encounters! (Above) A GREAT SNAKE DAY! Karl at age 19 while serving in the U.S. Air Force at Pope AFB, NC (Fall 1985). 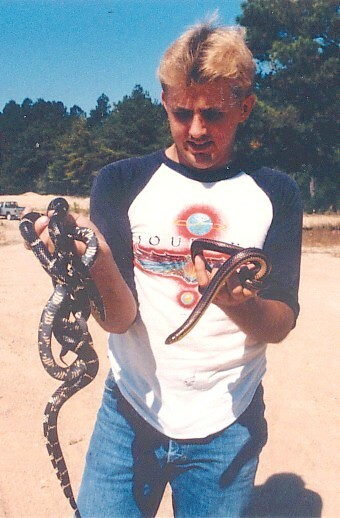 I had collected two large adult E. Kingsnakes and a Rainbow snake on or near Ft. Bragg, NC. I caught the Rainbow snake on the bank of the Little River while it was eating a freshwater eel! 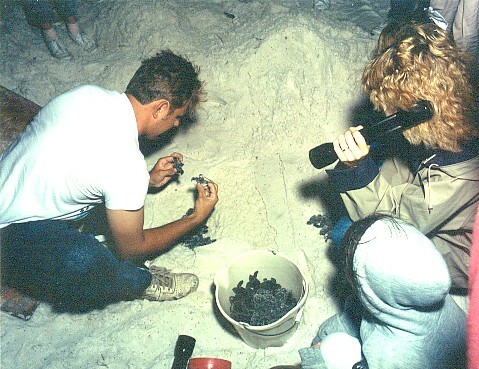 (Below) Karl conducting sea turtle research at Eglin AFB, Summer 1989. This was a public sea turtle hatchling release where people were invited to watch the little turtles be released into the Gulf. Site Created : 30 May, 2007. Copyright ©, Karl R. Studenroth Jr. All photographs on this site were taken by or are the property of Karl Studenroth and are also copyrighted. Photos may only be used with prior permission from Karl Studenroth.